Question for Amnesty International – Is your Israeli offshoot still collaborating with the Israeli state? What kind of state you might ask creates a fake offshoot of an internationally renowned charity in order to try and prevent that charity criticising it? A police state would be the obvious answer. Most western democracies are not to perturbed about human rights organisations that operate on their territory. Israel however bans people from for example Human Rights Watch from even entering the country. Its own, genuine, human rights organisations like B’tselem and Breaking the Silence are under constant attack and subject to constant vilification by the Israeli state. People should bear in mind that the creation of a covertly state-controlled Amnesty International did not occur under Benjamin Netanyahu or his Likud predecessors. It was an Israeli Labour Government that used the state to set up a bogus branch of Amnesty International. 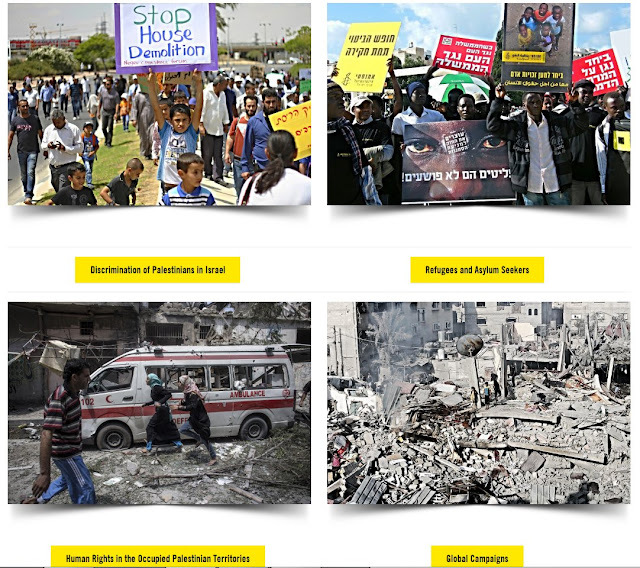 Having had a look at Amnesty International – Israel’s homepage it would appear to no longer be a wing of the Israeli state, however I have to confess I have never heard mention of AI-Israel either. I would hope that in the wake of these allegations, that Amnesty International investigates what happened in the 1970’s and whether or not the Augean stables have been cleansed of state control. The Israeli government funded the establishment and activity of the Amnesty International branch in Israel in the 1960s and 70s. Official documents reveal that the chairman of the organization was in constant contact with the Foreign Ministry and received instructions from it. What the minister reported to the Knesset was that for a number of years, Israel had tried to influence the Amnesty’s activity from within. 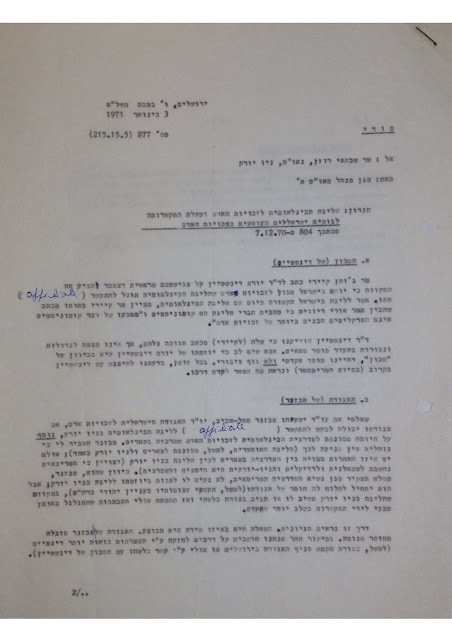 Documents collected by the Akevot Institute for Israeli-Palestinian Conflict Research and revealed here for the first time show that some of the people who headed Amnesty Israel from the end of the 1960s to the mid-1970s reported on their activity directly and in real time to the Foreign Ministry, consulted with its officials and requested instructions on how to proceed. Moreover, the Amnesty office was at the time supported by steady funding transferred to it through the Ministry of Foreign Affairs: hundreds of Israeli pounds for flights abroad, per diem allowances, registration fees and dues payments to the organization's headquarters. 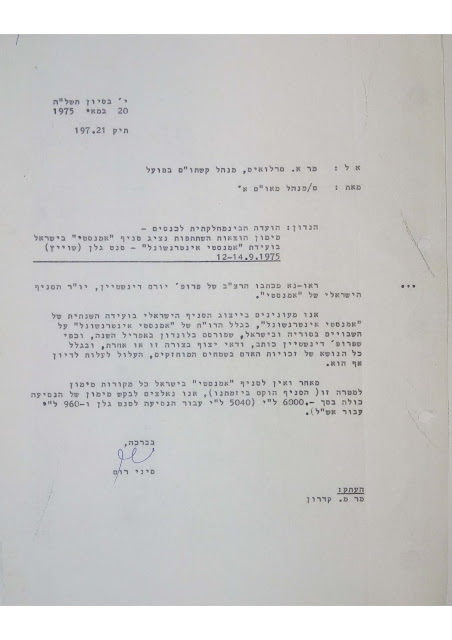 The documents show that the most substantive connection was between the Foreign Ministry and Prof. Yoram Dinstein, who headed the branch between 1974 and 1976. Dinstein, an internationally renowned expert on the laws of war who later served as president of Tel Aviv University, had previously been a Foreign Ministry official and served as the Israeli consul in New York. During his time as chairman of Amnesty Israel, years after he left the ministry, he regularly reported to his former colleagues on his activities and contacts with the international organization. Three years later, the Israeli branch of Amnesty began operations. They were volunteers working on behalf of prisoners worldwide. This activity, however, which from the outset was fairly limited, was damaged in the wake of a report Amnesty International published in 1969 about the situation of the Palestinians imprisoned in Israel. This dispute is the background to Minister Hillel’s report to the Knesset. “The Amnesty branch in Israel consists of one person (more precisely, one woman), who is Ms. Bella Ravdin who lives in Haifa. 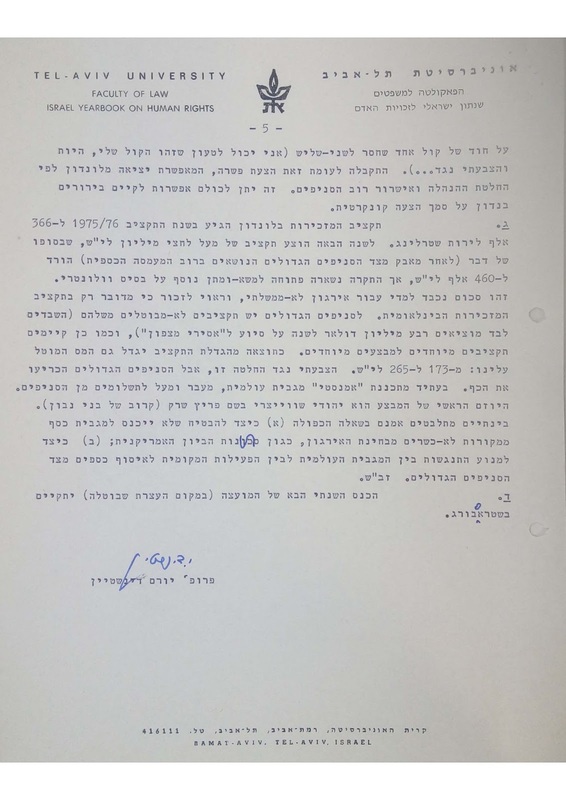 We are maintaining contact with her but it is not possible to trust her on every issue,” wrote Nathan Bar-Yaacov, the director of the Foreign Ministry department that dealt with international organizations and United Nations bodies, to head of the ministry director general's office Hannan Bar-On in December 1971. 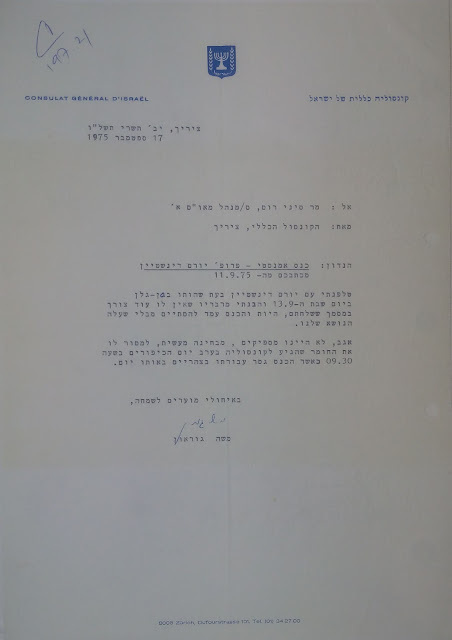 A 1975 article about Ravdin in Haaretz described her as a serial writer of letters to the editor at various newspapers and an activist for various issues, from legalization of prostitution to benefits for students. According to the article, she invested the money she received as German reparations for her mother’s death in a concentration camp into developing the Amnesty branch. The report says that her criticism of the organization's attitude towards Israel ultimately led her to cease acting on its behalf. In 1971 and 1972, Dinstein tried to establish a human rights institute at Tel Aviv University that would be funded by the Foreign Ministry. He discussed this idea with ministry officials but it was rejected, in part because of the size of the budget Dinstein requested – about 100,000 Israeli pounds (about $23,000 at the time, which, corrected for inflation, is in the neighborhood of $120,000 today). In July of 1972 the Israeli branch of Amnesty was reorganized and four lawyers were appointed to lead it in coordination with the organization's headquarters. The Foreign Ministry documents have little to say about this period and there are hardly any reports in the various archives about what happened in the organization during the subsequent year and a half. Things changed at the beginning of 1974, when Dinstein himself was chosen to head the local Amnesty branch. One of the documents shows that the meeting at which he was selected for the position was also attended by the Foreign Ministry officer who Dinstein would be in contact with during his time in office: the deputy director of the international organizations division, Sinai Rome. Dinstein immediately shifted the organization’s activity into higher gear: For the first time, Amnesty was officially registered as an association and adopted its articles of association. On May 22, 1974, Dinstein updated Rome on his activities – for the most part technical – since he had taken up the position. He requested 2,500 Israeli pounds (just under $600 in 1974; about $3,135 today) for routine expenses and attached an internal Amnesty document that detailed his income from branches abroad. Less than a month later, Rome wrote to “Dear Yoram” that his request had been granted and that 2,000 Israeli pounds (about $476 then; $2,490 today) had been transferred to him. 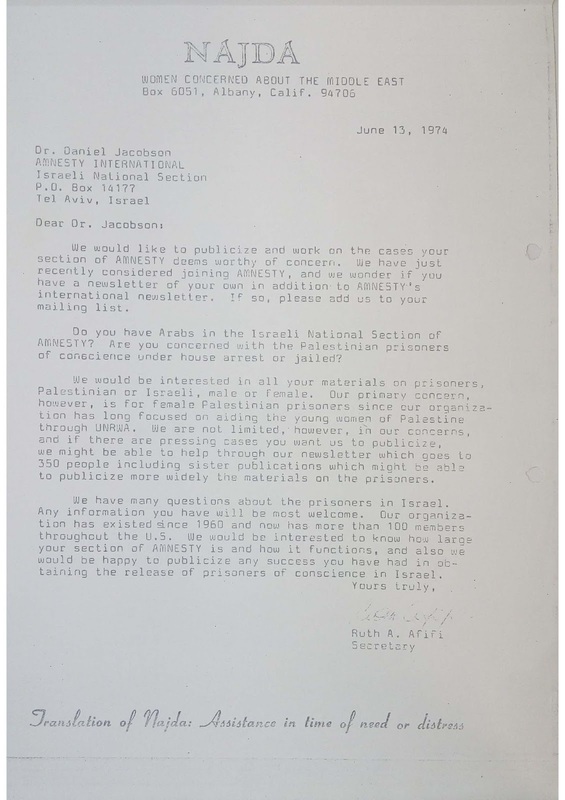 At least judging from the Foreign Ministry correspondence, Dinstein viewed his work at Amnesty through the narrow prism of making the case for Israel’s position. 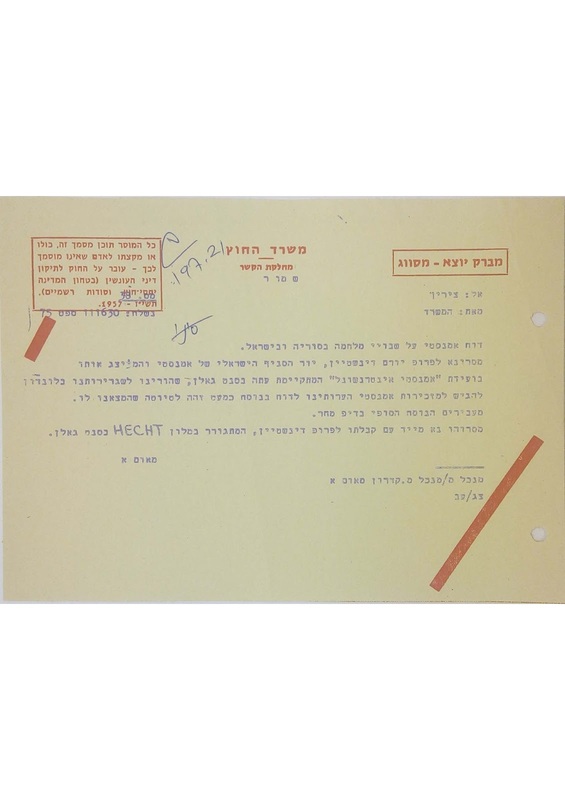 Thus, for example, he conveyed through the Foreign Ministry an article he wrote in response to an article critical of Israel published by human rights lawyer Felicia Langer in June of 1974. 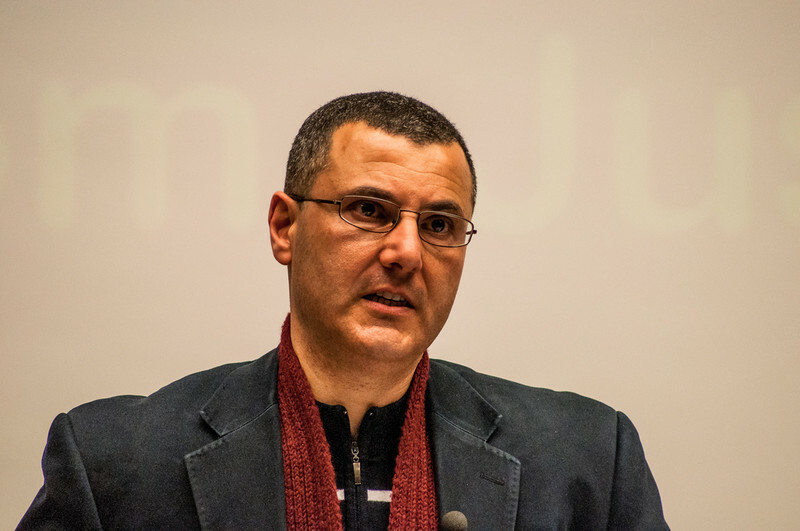 He began by noting that he was writing as “chairman of the Israel national section of amnesty” and did not mention his connection to the Foreign Ministry. Shortly thereafter Dinstein reported to Rome that he had received a letter from an Arab women’s organization in the United States requesting any information he had about Palestinian detainees and prisoners. 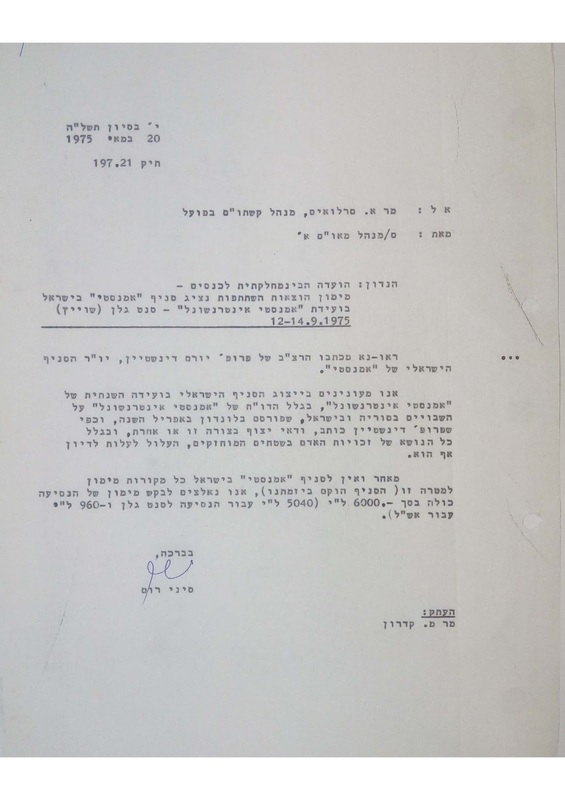 Including their letter, in which they also requested information about the Israeli branch of Amnesty, Dinstein wrote that he was leaning toward not replying but wished to consult with Rome on the matter. Rome replied: “It seems to us that there is scope for answering the letter and writing that ‘there are no Palestinian prisoners of conscience in the prisons but rather terrorists and others who have been tried for security offenses.’” He asked that all the correspondence be forwarded to Israeli consulates in New York and Los Angeles. In May of that year, Dinstein asked Rome for funding for a trip to an Amnesty conference in Switzerland. Rome was glad to tell him that he would receive 6,000 Israeli pounds ($1,000 at the time; about $4,650 today) for a plane ticket and four days per diem allowance. “Please inform me as to which travel agency we should send the money,” he answered. After the conference, which was held that September, Dinstein sent a report with a survey of the organization’s activities and noted that Dr. Nitza Shapiro-Libai also attended the conference as an observer on behalf of the branch. Dinstein wrote that Amnesty’s political leanings were generally left-ish but it could not be said that it was an extreme leftist organization. He explained that there had been a discussion about relocating the organization’s headquarters to Geneva and that the decision had not yet been taken. “The atmosphere that prevails in all of the international organizations centered in Geneva will, in my opinion, be a stumbling block for Israel," he wrote. "I don't know anything," replied Dinstein when told of evidence that shows otherwise. He added, “I don’t remember,” and ended the conversation. During those years, Avi Primor was a diplomat in the Foreign Ministry. He too is mentioned in a few items of correspondence from 1977, which were addressed to him as head of the international organizations division. He has known Dinstein personally ever since they were both 17-year-old university students before their conscription into the Israel Defense Forces. 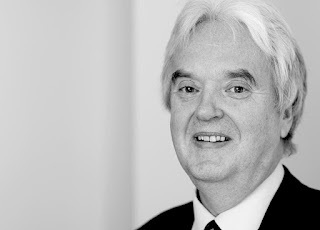 Primor related that Dinstein joined the Foreign Ministry at the same time he did, but did not stay there for very long because he preferred the academic world. It is difficult to imagine a situation today in which senior officials of a human rights organizations would maintain a relationship with the establishment and receive funding from it. 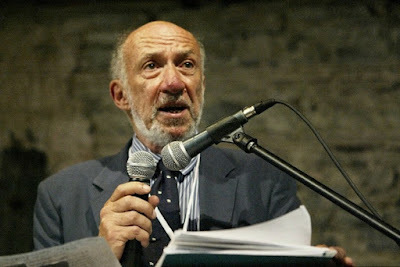 During that period, Dr. Edward Kaufman, who later became the chairman of the board of B’Tselem: The Israeli Information Center for Human Rights in the Occupied Territories, worked alongside Dinstein at Amnesty. 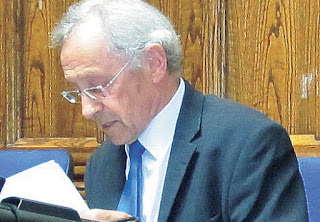 “It was a club of jurists and lawyers,” he told Haaretz this week. Kaufman relates that he had a conflict with Dinstein over the latter’s activity to benefit the state of Israel.” He saw himself as the State of Israel’s watchdog,” he recalls. However, Kaufman too is mentioned in Foreign Ministry documents as someone who was in contact with ministry staff, though he is depicted as less fervid than Dinstein. For instance, Rome thanks Kaufman for a report the he sent about an Amnesty conference on the subject of torture held toward the end of 1973, following the Yom Kippur War. “The main objective toward which the delegation worked was the release of the Israeli captives in Syria,” Kaufman wrote. He added that the cooperation with officials at the Israeli Embassy was productive and included a letter he had sent after the conference to the secretary of Amnesty International. Kaufman confirmed this and gave it context: He described an completely different atmosphere among human rights groups and the Israeli left operating under a different government than the one that prevails today, and notably, a different personal feeling toward the state. 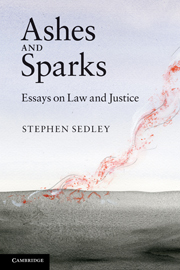 “There wasn’t a sense that there were grave problems with human rights. We are talking about the period of ‘enlightened occupation’ and at that time I felt quite good with respect to the situation of human rights in Israel and in the territories.” The Foreign Ministry, he said, wanted him to explain what was happening at Amnesty. “I don’t remember that I was given any briefing to do anything or to fight against anything,” he said. The Israeli branch of Amnesty now operating in Tel Aviv was registered as a nonprofit organization in 1988 and is a late incarnation of the association established some three decades earlier. In recent years nearly its entire budget comes from Amnesty International. The organization does not receive any money from the Israeli government and last year there was even an attempt in the Knesset to deny its donors tax benefits. In a statement, Amnesty's International Secretariat responded that the documents "present serious allegations suggesting that the leadership of our former Israel section acted in a manner that was blatantly at odds with Amnesty International’s principles." Touting "impartiality and independence" as the organization's core tenets, the statement points to a policy of not accepting government funds for any of its research or campaigns. "Our records show this principle was first formally agreed by the movement in 1975. No government should feel it is beyond our scrutiny," said the statement. The statement says that "Amnesty International maintained rules at the time prohibiting sections from working on cases of human rights violations in their own country. Our work on Israel was therefore determined by the International Secretariat, not the former Israel section. Throughout this time Amnesty International highlighted human rights abuses being committed by the Israeli authorities, including calling for the suspension of Israel’s use of administrative detention. 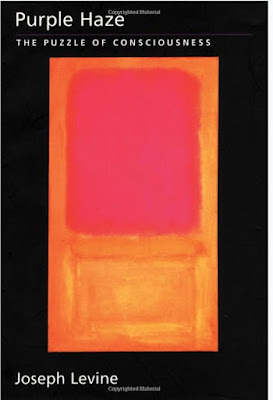 "During the period in question we were a movement that was still in its infancy. As we grew to become the truly global movement we are today, we have continued to develop robust governance policies and procedures to ensure stringent impartiality and accountability." Even the misnamed Campaign Against Anti-Semitism would have difficulty explaining how the use of the International Holocaust Remembrance Alliance definition of anti-Semitism is compatible with the banning of Israel Apartheid Week at one university, Central Lancashire and the restrictions place on several others. No one should make excuses for Corbyn’s cowardice over this. Prior to becoming party leader he had spent 30 years supporting the Palestinians. When he became leader he immediately backtraced as a result of having himself been accused of ‘anti-Semitism’. Instead of fighting back and saying that yes, he opposed anti-Semitism but he also opposed the political use of anti-Semitism to attack supporters of the Palestinians and anti-Zionists, he caved in. The result is that Labour is now further to the right on Palestine than it was under Tony Blair and Corbyn is reduced to nodding his head when Theresa May mentions the word ‘anti-Semitism’. 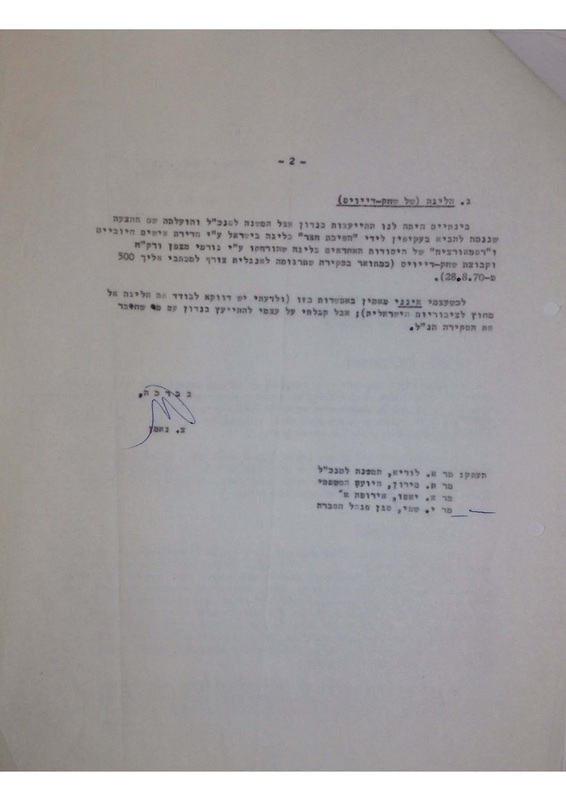 In my view any public authority which sought to apply the IHRA Definition to decisions concerning the prohibition or sanctioning of activity which was critical of the State or Government of Israel would be acting unlawfully if it did not require such activity also to manifest or incite hatred or intolerance towards Jews. If an authority applied the IHRA Definition without such a requirement it would be in breach of Article 10 of the Convention and would, therefore, be acting unlawfully under domestic law in the United Kingdom. Sedley gave a very coherent and cogent analysis of why the IHRA definition of anti-Semitism has been used, not to tackle anti-Semitism but as a means to clamp down on free speech on Israeli. “The purpose of this meeting is to draw attention to a growing concern about the misuse for political purposes of the concept of anti-semitism. The misuse in question is the conflation of criticism of Israel with hostility to Jews. Its political purpose is to prohibit or inhibit discourse or action inimical to the state of Israel. There are two distinct backstories to the catch-all meaning of antisemitism with which this meeting is immediately concerned. One is the longstanding, and largely successful, endeavour to segregate anti-semitism from racism. It has for a good many years been part of Zionist discourse to contend that racism is one thing – based on concepts of genetic inferiority – and anti-semitism another, based on historical and theological as well as genetic factors. 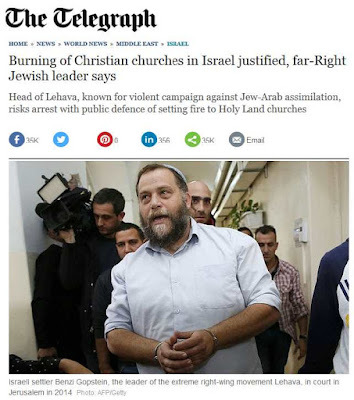 This is not the place to pursue the argument, save perhaps to note that anti-semites do not as a rule worry about whether their targets are observant, orthodox or secular Jews: their spleen is directed at members of a race. The other backstory is the Zionist claim to represent all the world’s Jews – a claim welcomed by Islamic extremists. Nothing suits Islamic fundamentalism better than the idea that all Jews are equally implicated in the excesses of Zionism. The claim depoliticises Zionism and legitimises jihadist anti-semitism. Against this already dangerous backdrop, we are now looking at the no doubt well-intentioned but naïve adoption by our executive government of a protean definition of anti-semitism which is open to manipulation and capture by the background interests I have mentioned. In this regard I would go rather further than Hugh Tomlinson does in his careful and well-reasoned Opinion. The governing proposition that antisemitism is “a certain perception of Jews, which may be expressed as hatred towards Jews” carries the clear implication that it may equally be expressed in other, unspecified, ways. As Hugh Tomlinson says, this passage is vague and confusing; but I am not sure that the critique should stop there. It seems to me that its open-ended formulation has a thought-out purpose: to bring within the pale of antisemitism perceptions of Jews – possibly but not necessarily of all Jews – which fall short of hatred. While this may legitimately cover familiar antisemitic slanders about greed, clannishness and so forth, it is also capable of embracing perceptions of Zionism which are the subject of legitimate debate and disagreement. That this is part of the intended reach is now becoming evident. One of the adopted examples is “Denying the Jewish people their right to self-determination, e.g. by claiming that the existence of the State of Israel is a racist endeavour.” This passage bristles with controversial assumptions. Is there a single entity capable of being characterised as “the Jewish people”? Am I obliged to regard myself as bound by ethnicity to people like Benjamin Netanyahu? Then, assuming that there is such an ethnic entity, from where does it derive a collective right to self-determination capable of defeating the right to self-determination of other peoples, above all the Palestinian people? There have been many Jews – my father was one – who long before 1947 opposed the Zionist project on the ground that Jewish exceptionalism was exactly what antisemitism needed. Lastly, accepting as one must that the state of Israel, whatever has been argued in the past about its right to exist, is a geopolitical ‘fact on the ground’, why are people, including many Jews, not entitled, without being branded anti-Semitic, to regard it in its present form as both a colonialist and an apartheid state? The demand that criticism, to be legitimate, must be ‘similar to that levelled against any other country’ assumes that there are other countries which behave like Israel. There may well be, but how can this properly be a precondition of any criticism? 1. The adoption by government of the IHRA’s “working definition” does not clothe it with any legal force. At the same time, it is not neutral: it may well influence policy both domestically and internationally. 2. No policy, however, can be adopted or used in defiance of the law. The Convention right of free expression, now part of our domestic law by virtue of the Human Rights Act, places both negative and positive obligations on the state which may be put at risk if the IHRA definition is unthinkingly followed. And s. 43 of the 1986 Education Act, while passed to deal with very different kinds of controversy, vouchsafes an individual right of free expression in all higher education institutions which cannot be cut back by governmental policies. For my part I am critical of the ECtHR’s judgment in CICAD v Switzerland, because it failed to recognise that the offending article, with its assertion that “when Israel is exposed … it is Judaism that is exposed at the same time” was a classic attempt to taint all Jews with Israel’s violations of human rights. Its author in my view had been rightly accused of antisemitism. One of the few things that Zionists use to uphold the pretence that Israel is a democracy is the fact that the Arabs/Palestinians can vote in elections for the Knesset. Now even this is no longer true. And it is true. At the May 2015 elections the Joint Arab List which included the Communist Party (Khadash) and Balad the secular Arab Nationalist Party gained 13 seats making it the 3rd largest party in Israel’s Knesset. There is just one problem. In Israel’s nearly 70 years of existence no Arab party has ever been part of the Israeli government. The only Arabs to become Ministers are seen as collaborators in their own communities. It is an unwritten rule in Israeli politics that no government must rely on the votes of the Arab parties. It was this that most incensed the Zionists when Yitzhak Rabin relied on Israeli Arab votes, who were not of course coalition partners, to defeat the right-wing parties led by Netanyahu. This more than anything else was the cause of his assassination. In an ethnocracy, which Israel is, where people vote according to whether they are Jewish or Arab, the power to expel the representatives from the minority can only be symptomatic of a dictatorship for that minority. Israel doesn’t have class parties of both Arabs and Jews. The Labour Party is a racist part for Zionists. Indeed it was the original party of Zionist racism. 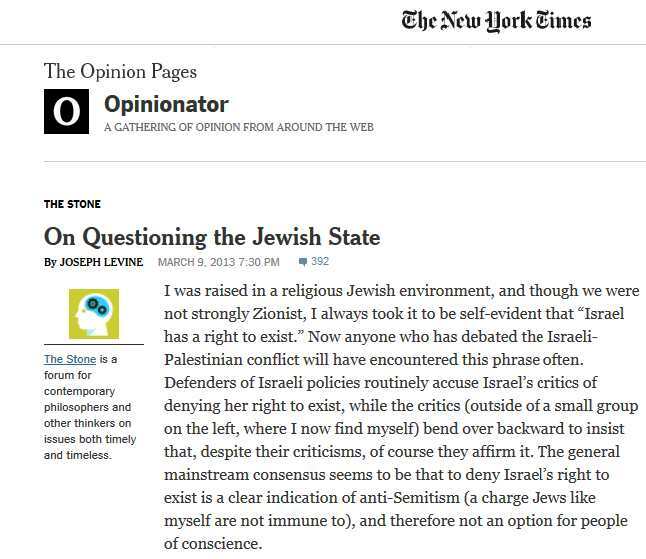 I have also included a very interesting article by Joseph Levine on questioning the Jewish State. It is published in the New York Times of all papers. I agree with it almost in its entirety. 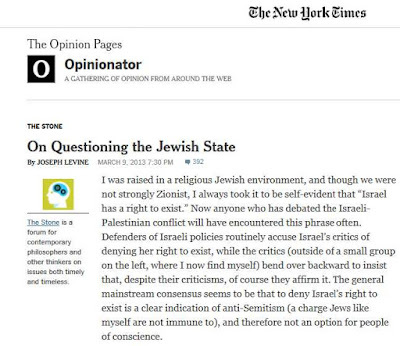 Perhaps the only lacuna is that Levine doesn’t mention that there is no Israeli nationality, just a Jewish nationality and a myriad of other, quite nonsensical nationalities in Israel. In other words there is only one important nationality, that of the dominant ethnic group or race – those who are Jewish. But his main thesis, that a Jewish state in which nationality and self-determination pertains only to one ethnicity in a state is bound to be racist is correct. Britain is a Christian state but it is a state of all its peoples. Christianity is a constitutional adornment, it has no effect on my rights as a Jewish citizen of Britain. But in Israel being Jewish means real privileges – access to land, the best schools, grants to universities, better employment, political privileges etc. That is why a Jewish state must be an apartheid state. 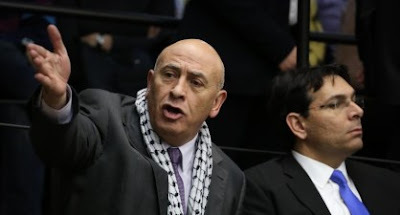 Yesterday, the Israeli Knesset voted to ban Israeli Palestinian political parties from participating in future elections. It accomplished this evisceration of Israeli democracy in the dead of night with only 29 members voting in favor (20 brave souls voted against, the rest were apparently asleep at the switch). 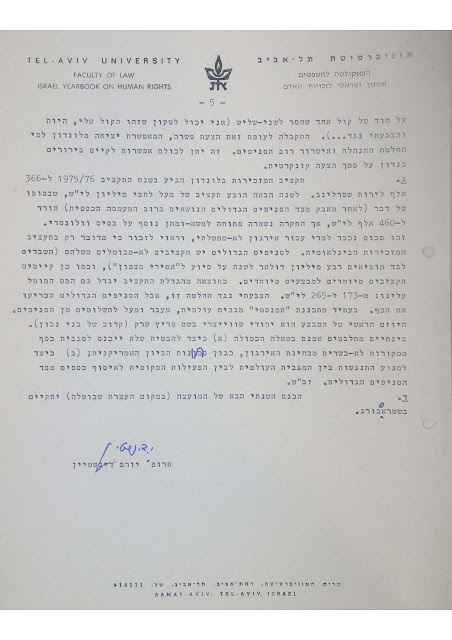 The means used was quite ingenious: the Basic Law was amended to read that no MK could sit in Knesset unless he or she affirmed that Israel was both a “Jewish and democratic state.” Jewish MKs have no trouble affirming both of these claims. But Palestinian MKs believe that Israel is not democratic and that it shouldn’t be Jewish (alone). The amendment passed also notes that MKs may be found to have violated it not only by their deeds, but by their public statements. This means that if a Palestinian MK exercises his right to free speech, he may be expelled from the Knesset. So with a few strokes of a fountain pen or keyboard, the most extremist of Israeli governments has effectively destroyed Israeli democracy. No self-respecting Israeli-Palestinian would be willing to affirm that Israel is and should be a Jewish state. It’s the equivalent of an American Jew affirming the U.S. should be a Christian nation; or an African-American affirming the U.S. should be based on Christian white supremacy. And without Palestinian representatives, the Knesset will become a Jewish-only body. In the past, every single Palestinian MK has been subjected to criminal investigation or other form of persecution by the Knesset itself. So the new law is further evidence of the Israeli Jewish campaign to render Israeli politics Arab-rein. It is part of a longer term initiative to “disappear” Palestinians both physically and politically from Israel. One must ask why only 20 MKs voted against this travesty? Their number included the Joint List and Meretz. Notably, it excluded virtually every other Jewish MK, including those from the supposedly liberal Labor Party. Do I hear the “A-word,” anyone? Coincidentally, today a UN body issued a report finding that Israel had become an apartheid state. It further urged that the UN reactivate the methods, resolutions and commissions it used to ostracize South Africa, when it too faced international opprobrium for its racist policies. The new version of the Basic Law further strengthens such findings. In truth, this is all a bit of political theater, since the Israeli elections commission decisions to expel Party lists or individual MKs must be ratified by the Supreme Court. This body, which has grown increasingly rightist, has in the past routinely overturned such rulings by the commission. It’s likely it will continue to do so. But as settlers are added to the Court it becomes increasingly likely it will eventually rubber stamp the anti-democratic racism of the legislative body. I was raised in a religious Jewish environment, and though we were not strongly Zionist, I always took it to be self-evident that “Israel has a right to exist.” Now anyone who has debated the Israeli-Palestinian conflict will have encountered this phrase often. Defenders of Israeli policies routinely accuse Israel’s critics of denying her right to exist, while the critics (outside of a small group on the left, where I now find myself) bend over backward to insist that, despite their criticisms, of course they affirm it. The general mainstream consensus seems to be that to deny Israel’s right to exist is a clear indication of anti-Semitism (a charge Jews like myself are not immune to), and therefore not an option for people of conscience. What does it mean for a people to have a state “of their own”? Over the years I came to question this consensus and to see that the general fealty to it has seriously constrained open debate on the issue, one of vital importance not just to the people directly involved — Israelis and Palestinians — but to the conduct of our own foreign policy and, more important, to the safety of the world at large. My view is that one really ought to question Israel’s right to exist and that doing so does not manifest anti-Semitism. The first step in questioning the principle, however, is to figure out what it means. One problem with talking about this question calmly and rationally is that the phrase “right to exist” sounds awfully close to “right to life,” so denying Israel its right to exist sounds awfully close to permitting the extermination of its people. In light of the history of Jewish persecution, and the fact that Israel was created immediately after and largely as a consequence of the Holocaust, it isn’t surprising that the phrase “Israel’s right to exist” should have this emotional impact. But as even those who insist on the principle will admit, they aren’t claiming merely the impermissibility of exterminating Israelis. So what is this “right” that many uphold as so basic that to question it reflects anti-Semitism and yet is one that I claim ought to be questioned? The key to the interpretation is found in the crucial four words that are often tacked on to the phrase “Israel’s right to exist” — namely, “… as a Jewish state.” As I understand it, the principle that Israel has a right to exist as a Jewish state has three parts: first, that Jews, as a collective, constitute a people in the sense that they possess a right to self-determination; second, that a people’s right to self-determination entails the right to erect a state of their own, a state that is their particular people’s state; and finally, that for the Jewish people the geographical area of the former Mandatory Palestine, their ancestral homeland, is the proper place for them to exercise this right to self-determination. The claim then is that anyone who denies Israel’s right to exist as a Jewish state is guilty of anti-Semitism because they are refusing to grant Jews the same rights as other peoples possess. If indeed this were true, if Jews were being singled out in the way many allege, I would agree that it manifests anti-Jewish bias. But the charge that denying Jews a right to a Jewish state amounts to treating the Jewish people differently from other peoples cannot be sustained. 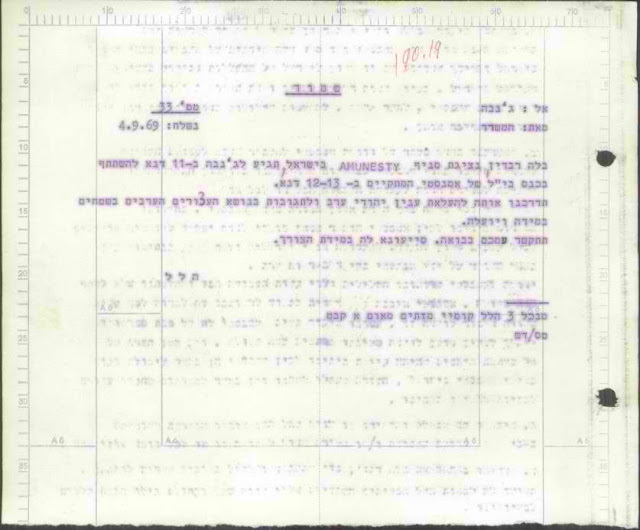 To begin, since the principle has three parts, it follows that it can be challenged in (at least) three different ways: either deny that Jews constitute “a people” in the relevant sense, deny that the right to self-determination really involves what advocates of the principle claim it does, or deny that Jews have the requisite claim on the geographical area in question. In fact, I think there is a basis to challenge all three, but for present purposes I will focus on the question of whether a people’s right to self-determination entails their right to a state of their own, and set aside whether Jews count as a people and whether Jews have a claim on that particular land. I do so partly for reasons of space, but mainly because these questions have largely (though not completely) lost their importance. The fact is that today millions of Jews live in Israel and, ancestral homeland or not, this is their home now. 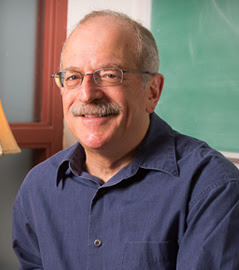 As for whether Jews constitute a people, this is a vexed question given the lack of consensus in general about what it takes for any particular group of people to count as “a people.” The notion of “a people” can be interpreted in different ways, with different consequences for the rights that they possess. My point is that even if we grant Jews their peoplehood and their right to live in that land, there is still no consequent right to a Jewish state. However, I do think that it’s worth noting the historical irony in insisting that it is anti-Semitic to deny that Jews constitute a people. The 18th and 19th centuries were the period of Jewish “emancipation” in Western Europe, when the ghetto walls were torn down and Jews were granted the full rights of citizenship in the states within which they resided. The anti-Semitic forces in those days, those opposing emancipation, were associated not with denying Jewish peoplehood but with emphatically insisting on it! The idea was that since Jews constituted a nation of their own, they could not be loyal citizens of any European state. The liberals who strongly opposed anti-Semitism insisted that Jews could both practice their religion and uphold their cultural traditions while maintaining full citizenship in the various nation-states in which they resided. But, as I said, let’s grant that Jews are a people. Well, if they are, and if with the status of a people comes the right to self-determination, why wouldn’t they have a right to live under a Jewish state in their homeland? The simple answer is because many non-Jews (rightfully) live there too. But this needs unpacking. First, it’s important to note, as mentioned above, that the term “a people” can be used in different ways, and sometimes they get confused. In particular, there is a distinction to be made between a people in the ethnic sense and a people in the civic sense. Though there is no general consensus on this, a group counts as a people in the ethnic sense by virtue of common language, common culture, common history and attachment to a common territory. One can easily see why Jews, scattered across the globe, speaking many different languages and defined largely by religion, present a difficult case. But, as I said above, for my purposes it doesn’t really matter, and I will just assume the Jewish people qualify. So, when we consider whether or not a people has a right to a state of their own, are we speaking of a people in the ethnic sense or the civic one? I contend that insofar as the principle that all peoples have the right to self-determination entails the right to a state of their own, it can apply to peoples only in the civic sense. But if the people who “own” the state in question are an ethnic sub-group of the citizenry, even if the vast majority, it constitutes a serious problem indeed, and this is precisely the situation of Israel as the Jewish state. Far from being a natural expression of the Jewish people’s right to self-determination, it is in fact a violation of the right to self-determination of its non-Jewish (mainly Palestinian) citizens. It is a violation of a people’s right to self-determination to exclude them — whether by virtue of their ethnic membership, or for any other reason — from full political participation in the state under whose sovereignty they fall. Of course Jews have a right to self-determination in this sense as well — this is what emancipation was all about. But so do non-Jewish peoples living in the same state. Any state that “belongs” to one ethnic group within it violates the core democratic principle of equality, and the self-determination rights of the non-members of that group. This fundamental point exposes the fallacy behind the common analogy, drawn by defenders of Israel’s right to exist as a Jewish state, between Israel’s right to be Jewish and France’s right to be French. The appropriate analogy would instead be between France’s right to be French (in the civic sense) and Israel’s right to be Israeli. 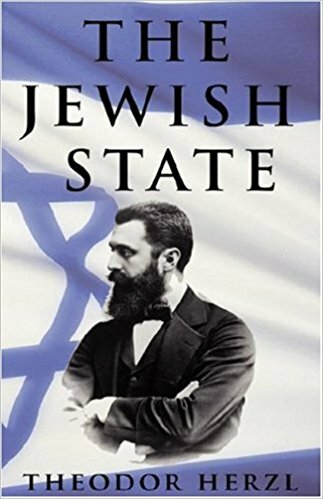 I conclude, then, that the very idea of a Jewish state is undemocratic, a violation of the self-determination rights of its non-Jewish citizens, and therefore morally problematic. But the harm doesn’t stop with the inherently undemocratic character of the state. For if an ethnic national state is established in a territory that contains a significant number of non-members of that ethnic group, it will inevitably face resistance from the land’s other inhabitants. This will force the ethnic nation controlling the state to resort to further undemocratic means to maintain their hegemony. Three strategies to deal with resistance are common: expulsion, occupation and institutional marginalization. Interestingly, all three strategies have been employed by the Zionist movement: expulsion in 1948 (and, to a lesser extent, in 1967), occupation of the territories conquered in 1967 and institution of a complex web of laws that prevent Israel’s Palestinian citizens from mounting an internal challenge to the Jewish character of the state. (The recent outrage in Israel over a proposed exclusion of ultra-Orthodox parties from the governing coalition, for example, failed to note that no Arab political party has ever been invited to join the government.) In other words, the wrong of ethnic hegemony within the state leads to the further wrong of repression against the Other within its midst. There is an unavoidable conflict between being a Jewish state and a democratic state. I want to emphasize that there’s nothing anti-Semitic in pointing this out, and it’s time the question was discussed openly on its merits, without the charge of anti-Semitism hovering in the background.